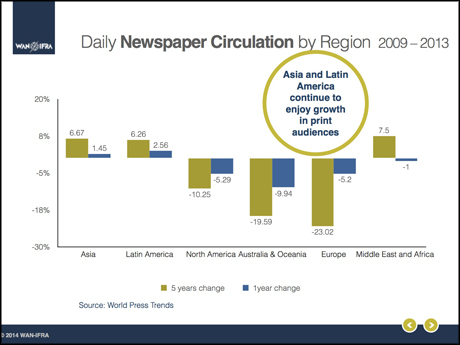 There’s no question that a larger audience for news is a good thing, but as the continued financial woes of mainstream newspaper publishers have shown, monetizing that audience is becoming increasingly difficult. 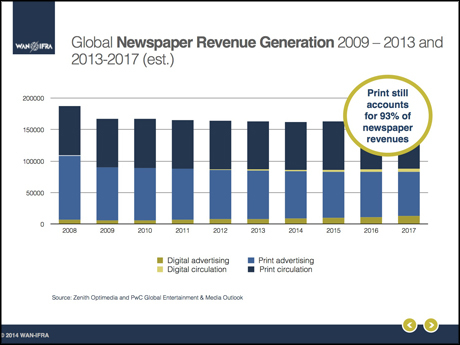 Print-based advertising continues to decline at a rapid pace as advertisers move online and look for different ways of reaching consumers, and not only are digital revenues failing to fill that gap, but it’s unclear whether they will ever manage to do so. The picture is a bit more complicated than just declining ad revenues. Opex costs should reduce as more and more content is created and consumed digitally. There are substantial capex costs in transforming the publisher. Eventually these will begin to bear fruit and the reduced ad revenues should be able to support the reduced cost base. The question is, therefore, how quickly publishers can make the transformation happen, while developing alternative revenue streams. 90% of what is classified as “news” is political propaganda. Why should anyone pay for propaganda.